The beauty of this cake is it's simplicity and versatility. You can basically use any flour and add any fruit or flavour, and it will always turn out great. Just stir the ingredients together in five minutes, and 40 minutes later you'll pull a lovely cake out of the oven. I found the basic recipe on the Romanian site Carte de Retete, performed by Adina's beautiful mini chefs - watch the video, it's too cute, even if you don't understand the Romanian. 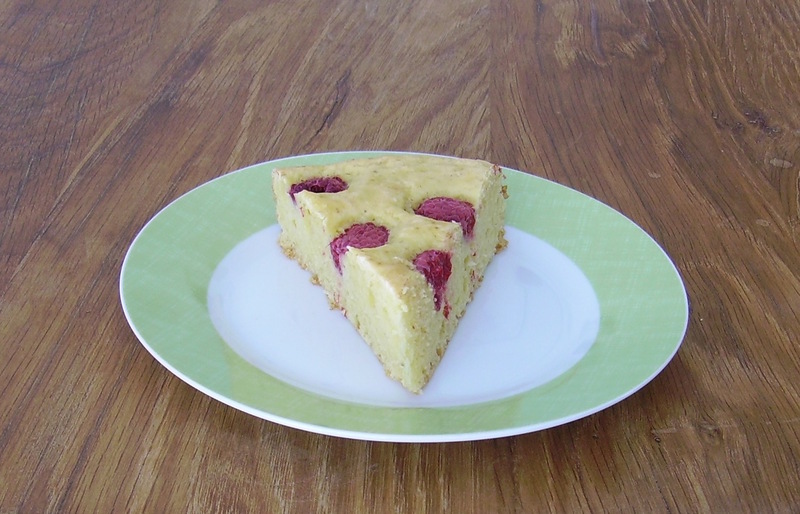 Originally, it's a cake made with yoghurt and strawberries (prajitura cu iaurt si capsuni). I've made it that way several times and then decided that it's a fantastic base for many variations. As stated above, you can make it with basically any flour, with or without gluten, it will always turn out yummy. Since I don't like it very sweet, I reduced the sweetener from 175 g of sugar to a total of 140 g, of which 100 g erythritol (which has only 70% of the sweetness of sugar) and 40 g raw cane sugar. That was plenty sweet for DH and me, but feel free to use the whole 175 g of sugar. Place all ingredients except for the raspberries in a large bowl, stir together until well combined, pour into spring form. 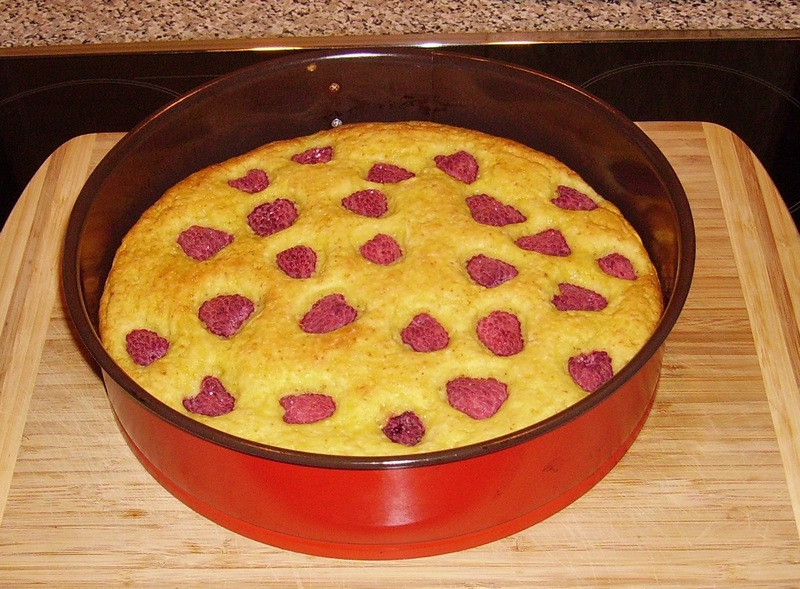 place raspberries on top, press gently down a bit. 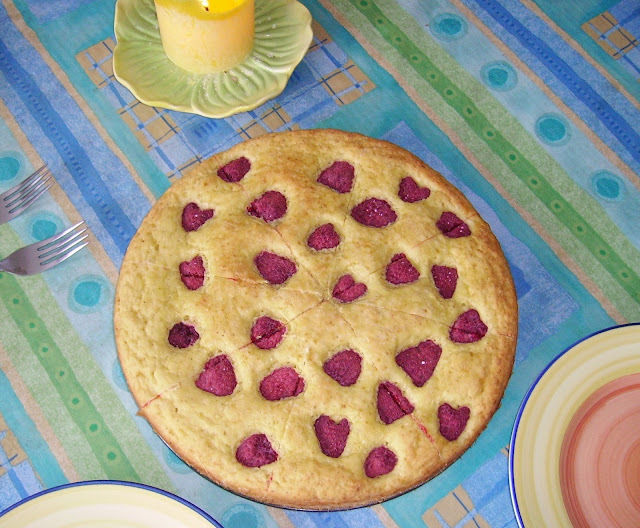 Bake the cake at 150°C / 300°F in a fan assisted oven (or slightly higher temp. in a static oven) for 40-45 minutes. Top it with powdered sugar or whipped cream or ice cream, or have it plain like we did, just as you like!